Please note that from the 8th April the section of the Sligo Way between the Ballygawley Woods and Slish Wood will be closed to facilitate trail rehabilitation works. Apologies for any inconvenience caused. 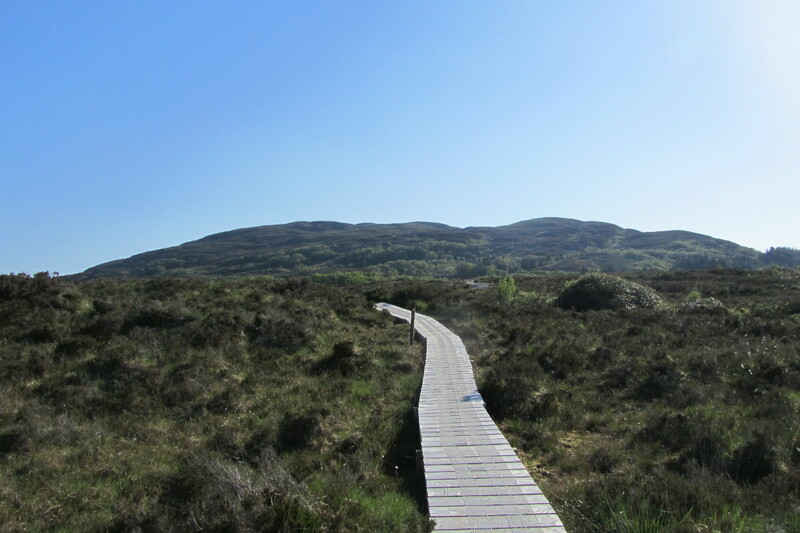 The Sligo Way is a waymarked long distance walking route which starts at Lough Talt on the Sligo Mayo border (R294). It continues eastwards for approximately 80km/50 miles along the line of the Ox Mountains, ending at Dromahair, Co Leitrim. With intriguing archaeological and geological features along the route. 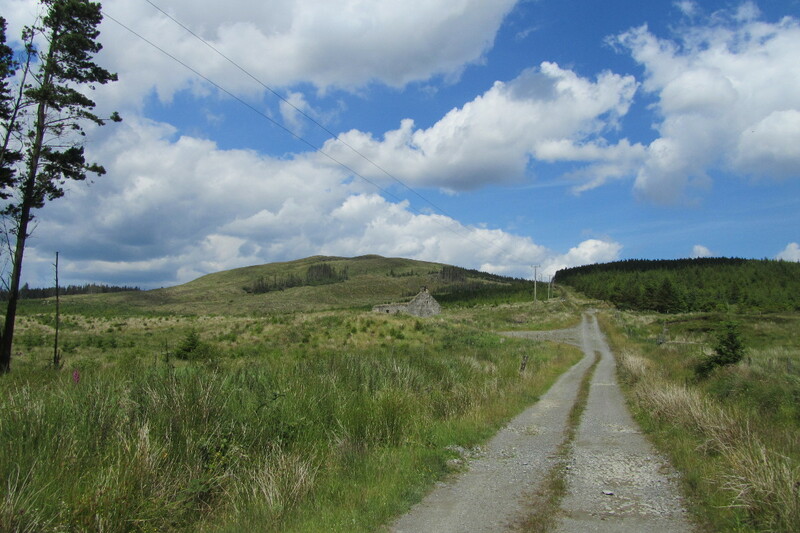 The Sligo Way covers a range of terrain, including quiet country roads, laneways and forest tracks. The walk is signposted using a combination of wooden marker posts and metal finger posts. It can be walked in sections or in it’s entirety which is estimated would take approximately 3 days. The flora along the Sligo Way is typical mix of blackthorn, heather, primrose, fox glove and many other plants. You’re also likely to encounter fallow deer, stoats and pine martens along the route, while above are sparrowhawks, finches and peregrine falcons. Look out for rowan trees with their reddish bark; the Celts believed these trees were sacred and that they protected against evil spirits. These trails may have some climbs and may have an uneven surface where the going is rough underfoot with some obstacles such as protruding roots, rocks etc. The routes are appropriate for people with a moderate level of fitness and some walking experience. Specific outdoor walking footwear and clothing is recommended. Notice: Some of the property traversed by the Sligo Way is private property. Access is available by kind permission of all the landowners and farmers on the route. It is understood that persons entering by permission do so with the consent of the landowner and no matter how often they enter, or in what numbers, they do not do so as of right. No amount of expenditure by the partners to this agreement or by private individuals on the route being used will alter this position. Nothing in this notice shall impact or address any pre-existing public rights of way. Dogs are not permitted on sections of the trail that cross open farmland. Description: The Sligo Way begins with a route directly through forest plantations. It connects to the Western Way at the gap above Lough Talt. The Route: The Sligo way starts/finishes at Largan/Lough Talt Church near the head of Lough Talt. It follows a minor road for a couple of kilometres before turning left onto a broad forestry road, through several fields of conifers. Continue straight through a cross roads leading to a picturesque ruin. 6.5km – Just above the ruin, the road veers right, keep left along a grassy way marked path which climbs gently up hill, this path is soft underfoot during wet weather. Pass a crest and fork right onto a forest road, continue along the track through the forest clearing, with stunning views over Lough Easkey. Reach the forest edge; keep left across two wooden footbridges, crisscrossing drains. Continue across open moorland until you reach the shore of Lough Easkey and a rough lakeside track. Follow the yellow way markers to the right along the lakeshore, turn right and cross some open farmland past a cottage to reach the public road. Did you know? The Famine Wall – a massive stone wall runs from the gap above Lough Talt to Gorteslin, along the lower slope of the Ox Mountains almost parallel to the R294. 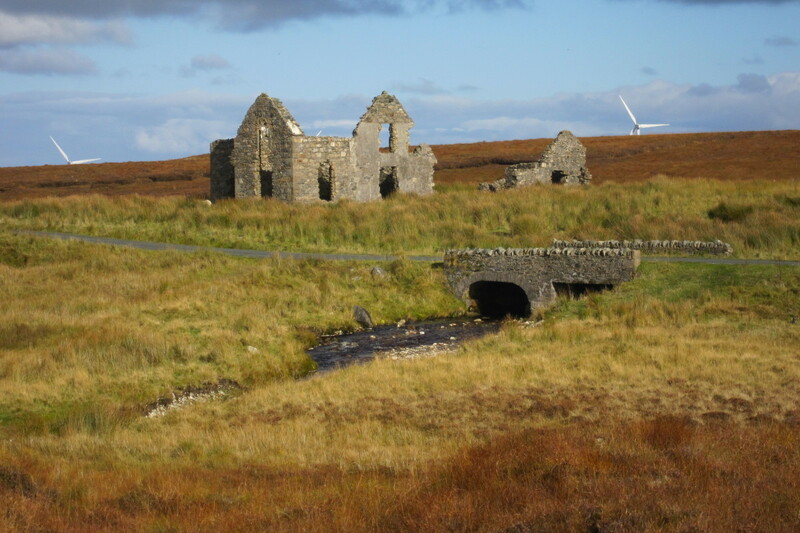 Although it was never completed, local folklore tells of it being built as an estate boundary in the 1840s, before and during the famine, by tenants in return for food. Description: The section of the way initially follows a mountain road along the rugged shores of Lough Easkey before climbing uphill into the Owenduff river valley. The Route: Follow the mountain road from the shores of Lough Easkey, past various turf cutting areas; at around 16km look out for an old hunting lodge on the right. At approx 18km turn right at the water treatments works. Continue along this road under the shadow of the windmills for approx 2.5km until you reach a crossroads. Keep right, heading up the hill to Kings Mountain. Following the bog road, cross a stile and continue down unto the valley. Keep left along the way marked trail which winds its way down past a farm house taking in stunning views over the surrounding countryside, before joining the public road again. Did you know? As you walk northwards away from Lough Easkey, look out for the large boulders formed from quartzite and metamorphic rock, with strange and varied mineral colours from blue to honey-brown and red. As this is metamorphic terrain the rock, formerly sandstone, was transformed by intense pressure and heat. The most interesting of these rocks is on Masshill. Here a 10-tonne boulder known as the ‘Rocking Boulder’ is balanced on the edge of a cliff. Famously, it can be moved with the strength of a single person’s arm. Description: This section of the route follows minor mountain roads and tracks across the top of Templeboy to the scenic Ladies Brae and Lough Achree. The Route: A quaint and winding road leads up through Ballygreighan, followed by mountainous minor roads which lead up into the Ox Mountains, past Lough Achree at 31km before your arrive at the scenic viewing points of Ladies Brae. At 29.5km, there is the option of a turn off- track towards Dunmoran Strand/ Aughris Head (6km from Farnaharpy) where a lovely cliff top walk has been developed. Did you know? Formed in 1490 by an earthquake Lough Achree which lies just off the Ladies Brae is reputed to be the youngest lake in Ireland. Local folklore suggests that on a clear day one can see the reflection of the lost village in the waters of the lake. Description: An initial short climb is followed by a long descent onto the southern slopes of the hills. The high bog roads are followed by quiet minor roads passing numerous small farm holdings. To the south you’ll be able to see the single Hill of Knocknashee, 5km in the distance and rising 300m into the air. It is the site of an astounding and recent archaeological discovery: 30 circular house sites and two large cairns, thought to be passage tombs. The Route: Follow the way up along the quiet Ladies Brae road. At around 35.5km reach a crossroads; turn left uphill along a good bog road. This soon levels out and starts descending reaching a tarmac surface at a house. 38km – Look out for a wedge tomb in the field beside the road, the tomb is known locally as the Giant’s Grave. At approximately 41.5km, follow the way markers to the right onto a quiet road, which winds its way straight through a cross roads into Rockfield. At a T-junction turn left, continue past the church to enter Coolaney village along the pleasant riverside walk. Don’t Miss! Just east of Coolaney village on the edge of the Ox Mountains lies an area called Tullaghan and the Hungary Rock. Legend holds that if you throw a pebble at Hungary Rock whenever you pass, you will never go hungry on your journey. Tullaghan also has a famous well close to the Hungary Rock, where its waters are reputed to rise and fall with the tide and legend has it that the water it contains can never be boiled. Description: The way here lies mainly along quiet back roads running roughly parallel to the low rugged hills of Carricknasheeoge and Slieveward on your left. The tall church spire in Collooney is visible from afar. The Route: Depart from Coolaney village by the road at the corner of O’Gradys’ Bar. Follow this road for approx 1.5km (crossing the disused railway line). 46km – Turn left at a sort of staggered crossroads and follow an ancient road which is grassy and soft underfoot in places. Rejoin a tarred road and continue straight ahead passing the ruins of Moymlough Castle at 48km. Turn right up a tree lined avenue along the boundary of the Annaghmore estate. Keep left along the road crossing the Owenbeg river just past Annagh Beg. 52km – At a fork in the road keep right, passing the entrance to the railway station as you enter Collooney village. Did you Know? In September 1798 just north of Collooney, the Battle of Carrignagat was fought. The British had a cannon positioned on Parkes Hill that was causing the French great distress. After an hour of intense fighting the French were still unable to disable the gun. Then Bartholomew Teelling rode his grey horse across a stretch of level grass and shot the gunner dead. His actions were of great importance, and a monument was built to the memory of Teeling. Description: This route begins with a woodland walk through leafy Union Wood. Follow a rambling forest track through the Ballygawley Wood, and onwards up the slopes of Slieve Deane. The mountain route then leads onto rugged country and past Lough Lumman, followed by some rough tracks which lead down to Slish Wood. 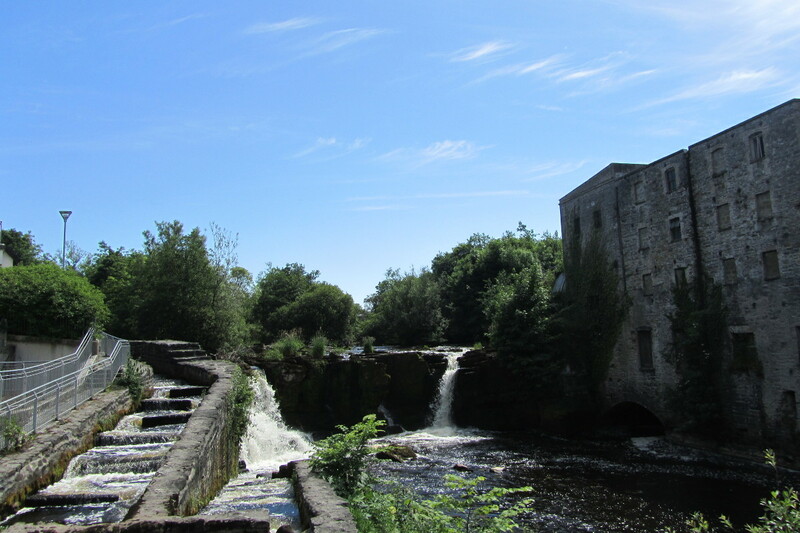 The Route: 56km – From the Church spire in Collooney, continue down past the school, cross the road, follow the way marked trail past the corner of a two storey house, under a bridge and along a winding road that leads into Union Wood. At 58km it’s worth making a detour to Union Rock, a good viewing point with commanding views in all directions. 59.5km – At a four way junction of tracks, keep left. Exit Union Wood, cross the R284 and follow the winding path up into the Ballygawley woods. Pass under power lines at 64km and continue along the stone track. 66km – The track winds through rocky cliffs and passes through a ‘tunnel’ of gorse (stiff, evergreen shrubs) before reaching Lough Lumman. 67km – The main track swings right and downhill towards the forest. Take care to locate a left turn, continuing along a less pronounced path. 68km – When you reach a forest corner turn right down a slabby fire break (take care especially if following this route in reverse). When you meet a track at the bottom corner, turn left. 69km – Cross a stream and continue on to a forest road. Follow this until you make a short steep climb to emerge on a better track. Turn right downhill to the main road and enter Slish Wood. Did you know? Union Rock is the highest point in Union Wood and gives superb views in all directions. Allegedly the wood takes its name from events at this location; following the passing of the act of union uniting the kingdoms of England, Ireland, Scotland and Wales; it was here that Joshua Cooper of Markree hoisted the Union Jack in 1800. Description: The final section of the Sligo Way begins by traversing scenic Slish Wood on the shores of Lough Gill. 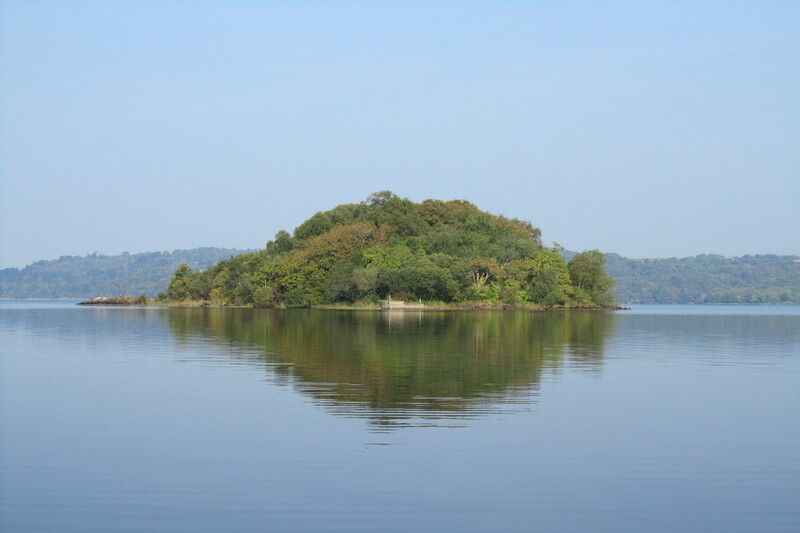 Innisfree is a beautiful island with many indigenous species of trees and shrubs and was made famous by William Butler Yeats in the renowned poem ‘The Lake Isle of Innisfree’. Innisfree can be clearly seen from the viewing area to the north of the trail in the Millennium forest at 75km. This is followed by a section of minor roads and tracks, winding up with a pleasant woodland path along the Bonet River in Dromahair. The Route: 71km – From the car park at Slish Wood, follow the way marked trail along the winding woodland path overlooking Lough Gill. As the track veers right uphill, keep left along the lakeshore. 74km – Ignore a turn left down to private property and continue on the grassy path. Cross a small footbridge and shortly after this exit Slish Woods onto rough moorland. A number of paths follow parallel routes to the lake shore – follow the way marked trail. 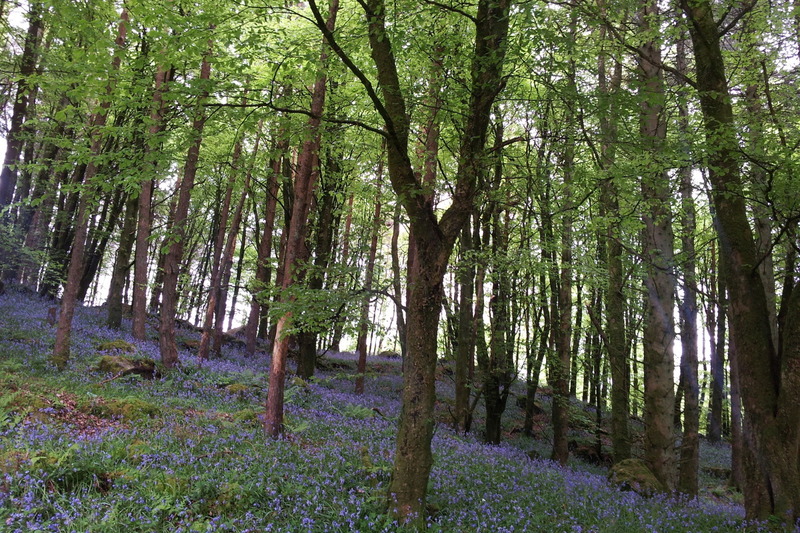 Reach an area of native woodland; this is one of the Millennium forests where a native tree has been planted on behalf of every household in Ireland using native Irish seed. These trees were planted as part of the restoration of these native woodland communities. Follow a forest road which leads out to Trawane Bay. 76.5km – Turn left down a wide dirt road and at the next sharp bend turn right uphill into a woody copse. Ignore a turn into an old house and continue through the forest, emerging onto a minor road. 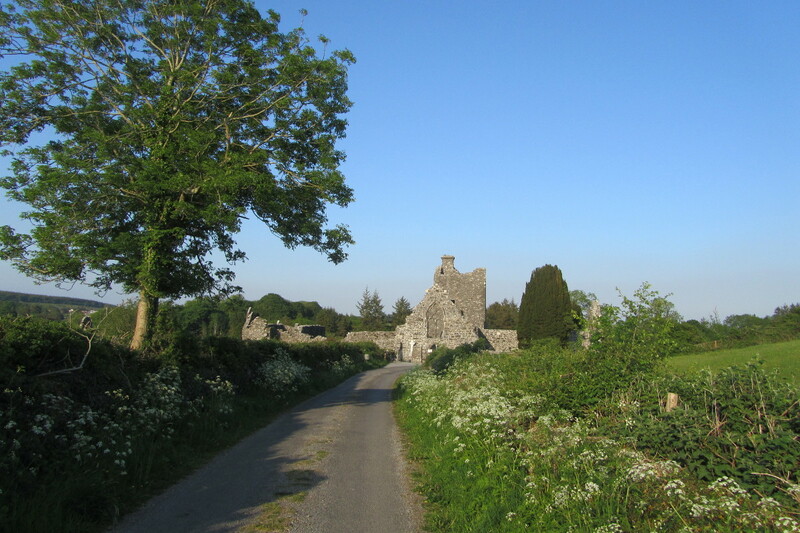 80km – Pass the ruined Creevelea Abbey on the right- hand side where the road descends past a cottage. Follow a pleasant woodland path leading to a concrete footbridge. Enter Dromahair village beside the Abbey Hotel. Did you know? Creevelea Abbey was erected at a great cost in 16th Century by the O’Rourke’s but only existed for 28 years before it was destroyed by fire. It was the last Franciscan friary to be built in Ireland before the dissolution of the monasteries imposed by Henry VIII. Also of note is Parkes Castle a 17th Century fortified manor house visible on the northern shores of Lough Gill. 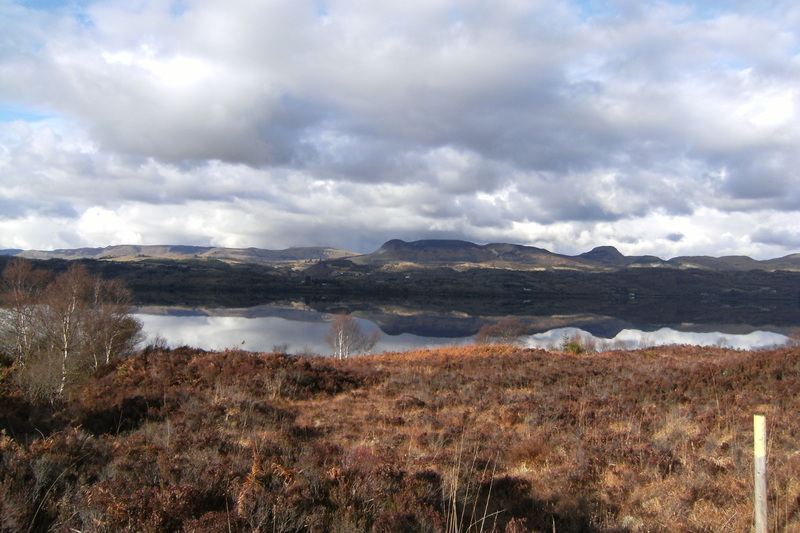 Hi , walked the Sligo way from coolaney to lough talt yesterday the 15th april. It was a beautiful walk till I reached lough Easley , the heavens opened and that was it. Got over lough Easley heading for lough talt after coming out of bog and low and behold ……. no arrow , ended walking about 5 kms extra wrong direction and then having to back track…….. a night mare. So for anybody walking the direction as I did its left and the left again when you come over from lough Easley. Safe walking all !!! !